Here we are in 2012. I really can't believe it!! Let's get the year started right with a little Challenge! 2. Oranges should be as "tango-y" as possible, but all shades of orange are welcome. 3. 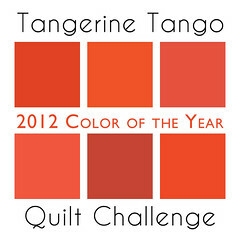 Focus should be on Tangerine, but 1 other color and 1 neutral can be included in the quilts. For our purposes, neutrals include shades of white, cream, beige, brown, gray, and black. 4. The contest will run from Jan. 2 through March 2. The top 10 finalists in each category will be announced on March 5 and winners will be announced on March 14. 5. You can submit one entry per category. Entries should be completed projects, including quilting & binding. 1. Since there will be lots of pictures in the Flickr Pool, please make sure to post pictures of your entries in the "Official Entries" threads (there will be 2 - one for minis and one for quilts). Please only post entries in these threads, not questions or comments. 2. Each entry should have 3 photos: full picture and 2 detail pictures. 3. Each entry should include quilt dimensions. 4. Entries should be complete & posted in the correct "Official Entries" thread by midnight PST on March 2nd, 2012. We have lined up some great sponsors and judges that we will announce in the coming weeks. To get you started though, we have arranged for a couple shops to create lovely tangerine bundles. Okay, I'm in! I already have my idea for the mini category. 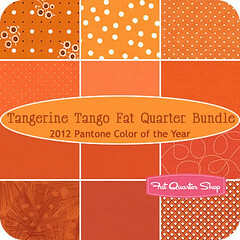 I'm very unworthy to participate but love the idea and so I may have to do something mini just for fun =) Love tangerine tango! What a FUN challenge! I'm going to do my best to participate! Okay I just finished mine and am getting ready to bind. I want to know if I will be disqualified if I use another color for binding. I am using black and orange solid and then I have a focus fabric that is #cream with black, green, orange, blue, and teal#. I posted a photo in the flickr stream. I was thinking of using teal for the binding but will stick with black if that's a problem. Thanks!